Pretty sure this isn't how things really went down. Remember the Thanksgiving story you learned in school — how, way back when, Pilgrims and Indians got together at one giant dinner table and ate turkey and stuffing and green beans covered in Campbell's mushroom soup? And then there was peace on Earth? We're all old enough to know that that is not how things really went down. So this week on Ask Code Switch, we're discussing how a new generation of parents and educators should talk to their kids about Thanksgiving. "I'm white. My husband is Afro-Brazilian. So our 5 yr old son checks a lot of boxes on the forms (white, black, native). It's been a hard, but honest year of explanations (so much more to say on that front). For example, we went into the roots of Columbus Day, but he also would not have existed if this history didn't take place. So we came to terms with why we don't celebrate it, but why we might if it were more along the lines of "Dia de la raza" in other countries. Thanksgiving feels harder. On its modern surface, it's about gratitude. Is it hypocritical to celebrate? And how to explain to a 5 year old that this positive concept covers up a messy past?" We've been hearing from a lot of people — especially parents and teachers — who are a little queasy about passing on the celebration of Thanksgiving to the youngsters in their lives. And that makes sense. Many people grew up loving the chance to get together with friends and family over a lovely meal and share what made them grateful. But as they got older, they started to feel less sanguine about the holiday's roots. 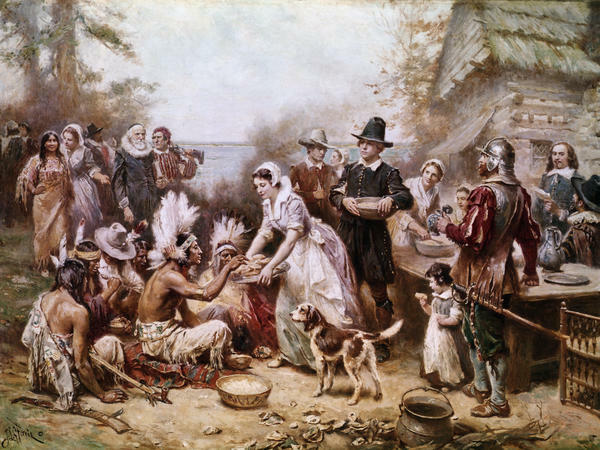 As authors Roxanne Dunbar-Ortiz and Dina Gilio-Whitaker write in their book, All The Real Indians Died Off, too often the way we tell the story of Thanksgiving "is a collective amnesia that fuels the perpetuation of Native American stereotypes, playing out over and over again in the classrooms and textbooks of American schoolchildren, generation after generation." 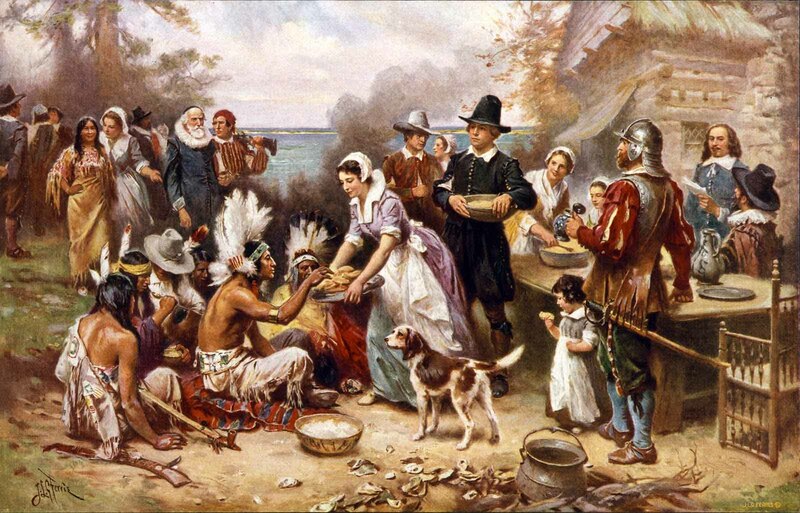 So before figuring out how to boil the real history down for kids, I think that we adults have to acknowledge to ourselves in plain terms what the actual history of Thanksgiving is. And while we like to think of the "first Thanksgiving" as a feel-good dinner shared by two equally powerful groups who were learning to get along, that story completely erases the context of how these groups came to rely on each other. "A more accurate telling of the story, however, describes the forming of political alliances built on a mutual need for survival and an Indigenous struggle for power in the vacuum left by a destructive century of foreign settlement," Dunbar-Ortiz and Gilio-Whitaker write. So, back to your question. Is it thorny to celebrate a holiday that glosses over that history? The short answer, I guess, is yes. But it's worth considering this: "As much as some Natives might like for it to, Thanksgiving is not going away," as staffers at Indian Country Today wrote in 2012 in their guide to talking to kids about the holiday. "And, in fact, many Natives fully enjoy the sentiments of Thanksgiving — it's the historical and cultural inaccuracies that are troublesome." So, Sara, I think one thing to remember when you're talking to your son about Thanksgiving is that this can't be his introduction to learning about Indigenous people. Make sure you're reading him children's books that feature contemporary Native American characters, outside of the context of this holiday. Talk to him about the Indigenous communities in your region — there are eight federally recognized tribes in New York, all of which have interesting and unique histories and cultures and economies and politics. And your son's own background is a great entry point for teaching him about Indigenous peoples of the Americas. How much does your husband know about his own Indigenous background? It's important for your son to start learning about that at a young age (and it sounds as if you've already gotten off to a good start). That way, there's less of a chance that your son will think of the Native Americans in the Thanksgiving story as some cartoon relic and more likely that he'll be able to start to piece together the bigger picture. It's easier for young minds to resist stereotypes if they have some real information to counteract what they might be seeing in school. Of course, over the years, you will slowly have to introduce your son to a lot of ugly histories. Some of them will affect him directly, and others will feel a little more abstract. But there is no part of life in the United States that isn't steeped in our particular, painful racial history. So I think Thanksgiving is a great time to express gratitude for what we have, while acknowledging the reality of what got us here. How do you celebrate Thanksgiving? And what advice would you give someone trying to teach their kid the truth about the holiday? Email us at CodeSwitch@npr.org. And if you have a racial conundrum of your own, fill out this form.